St Lucia was a young Christian girl who was martyred, killed for her faith, in 304AD. The most common story told about St Lucia is that she would secretly bring food to the persecuted Christians in Rome, who lived in hiding in the catacombs under the city. She would wear candles on her head so she had both her hands free to carry things. Lucy means 'light' so this is a very appropriate name. St. Lucia's Day is now celebrated by a girl dressing in a white dress with a red sash round her waist and a crown of candles on her head. (Normally electric candles are used for safety!) The crown is made of Lingonberry branches which are evergreen and symbolise new life in winter. 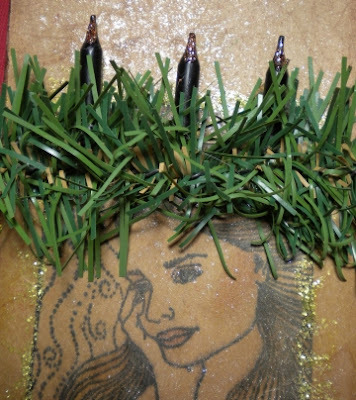 Schools normally have their own St. Lucias and some town and villages also choose a girl to play St. Lucia in a procession where carols are sung. A national Lucia is also chosen. Lucias also visit hospitals and old people's homes singing a song about St Lucia and handing out 'Pepparkakor', ginger snap biscuits. I thought long and hard about how I would convey something and have it translate into something we could appreciate if we weren't from Sweden. 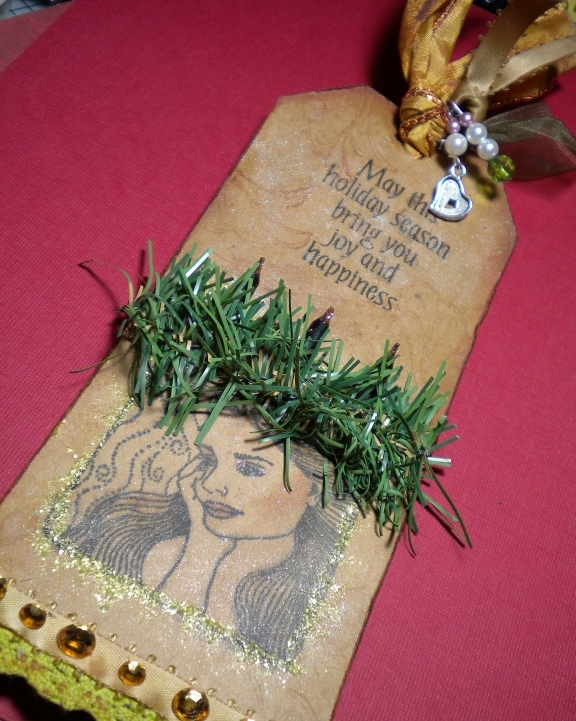 After following the Tim Holtz blog the last week and his 12 Days of Christmas Tags I decided I would make a special tag. I definately improvised, because I don't begin to have a fraction of the supplies he uses or have the techniques figured out that he uses, but I somehow thought the vintage feel of tag would go along perfectly with what I had in mind. I made the tag by simply cutting up a craftpaper folder with my regular paper cutter. Sure, you could use a fancy die-cut or buy a tag, but gee...how hard is it to cut a strip, angle the corners and punch a hole in the top! I distressed the edges and used distress inks in "Tea Dye" and "Old Paper" to make it look vintage. I also sprayed it fairly heavily with Tsukineko Sheer Shimmer Spritz and then zapped it with my heat gun to dry it quickly. 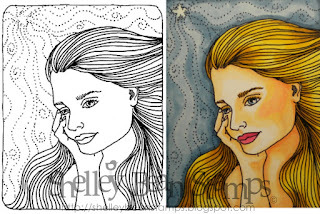 My St. Lucia was my very own stamp from Shelley Bean Stamps "Wish Upon a Star". I added some very light color using my Copic Markers and I framed the stamped image with Shabby Shutters Distress Stickles. I went and snipped a piece off the garland over my fireplace for the crown and used 3 birthday candles (cut down) with a touch of gold stickles for the flame. It's all about improvisation!! 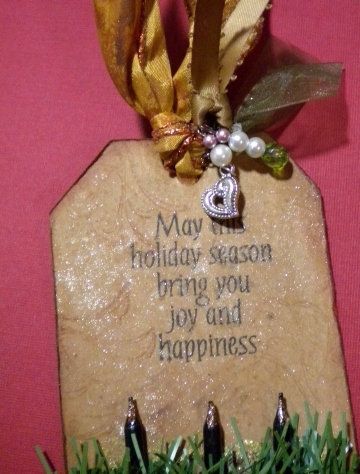 I used some beads and charms to attach to the ribbon and blinged out the bottom edge a little bit and added a holiday verse to finish off my tag. And now, before I send you off to the next stop along this wonderful hop, I wanted to share a free give-away! I am going to randomly choose a winner from the comments left here now through Sunday. The prize is my Wish Upon A Star stamp that I used to make this tag. Simply leave a comment. 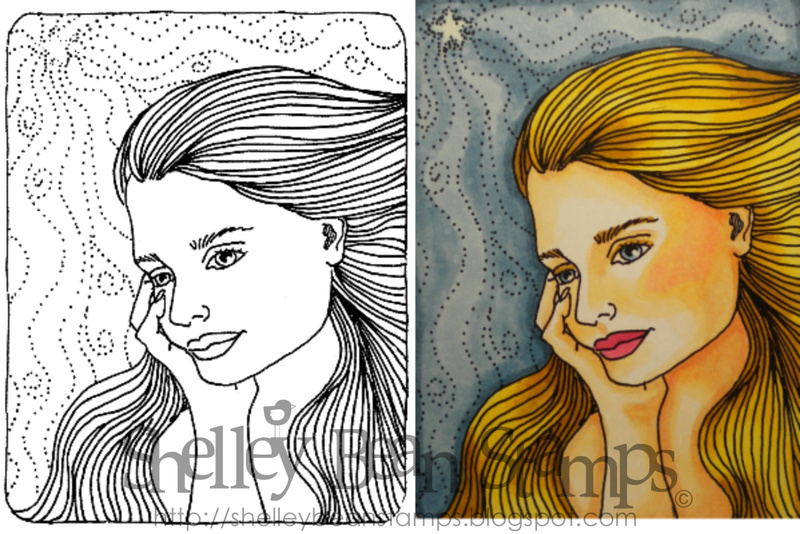 I would also love it if you became a follower of my blog and my stamp blog. But, I won't make it a requirement this time. I also have a friend page over at facebook that I would love to have you come visit and "like". I often do give-aways there as well. "God Jul" everyone! And now it's time to hop along to Vickie's Blog! If you lose your way along the hop, here is a listing of all the wonderful blogs participating today. Your tag is beautiful and captures Sweden perfectly! Thank you for sharing...your tag is so beautiful!!! great tag, it is very beautiful. That tag is very pretty, thanks for sharing. very very beautiful - love vintage and you pulled it off beautifully! Great tag! Thanks for sharing! Beautiful tag! Thanks for sharing the history of St. Lucia. Very pretty! Happy holidays to you and yours! Adorable. I love how you aged that I need to figure that part out.. I have everything needed just never mixed it thanks for the wonderful and beautiful ideas. Great job and yep I am following you :) on Facebook too hehe..
You tag is wonderful! I love the story of St Lucia, I have seen the figure of the girl in the dress with the wreath and candles but didn't know her origin. Thanks so much for sharing! I love the tag. I love the lights and just everything about it. So pretty. love the creativity you used with you tag. What a lovely story that was. Your project is adorable. TFS Martha C.
Such a pretty tag. I love the candles used for lights. Beautiful tag! Thank you for sharing the history behind the theme. I loved reading about the Swedish tradition. Happy to have found you and am now your newest follower! Your tag is beautiful! Very elegant! Love your tag, of course I will follow you on the blog its a wonderful way to pick your brain for Ideas that I will never have. Once again thank you for your inspiration. What a beautiful tag Shelley. Your tag is quite beautiful. Nice twist on non traditional stamps. really cute! love tim holtz! I Love your tag..it's really beautiful! Beautiful tag and stamp. Love it. You did an amazing job Shelley, Tim has nothing on you! and I just love how your stamp worked perfect!!! OMG... I wish I could color like that, just beautiful. That is SO BEAUTIFUL! You really nailed ot on the head...it does very much convey St. Lucia! TFS! You really captured it. I love what you did. Thank you for sharing something new with us. This tag is truly beautiful. Love how the tag looks swirly in the picture even. Thank you for the little history lesson. I love reading about the holidays around the world. TFS the Swedish story. Very interesting. Your tag is absolutely beautiful. Thank you for sharing. Your tag is just beautiful.TFS! Lovely tag! What a great way to show off Sweden! What a beautiful tag that women is beautiful! Thank you for sharing! HAPPY HOLIDAY"S Hopping around making new friends and now you are one! Thanks to KinderStampO! This is beautiful, I love vintage looking crafts! I am already a follower of your blog and also a friend on facebook! Thank you so much for sharing this Swedish history and tradition. I have seen the image of the girl with the circle of candles on her head, but never knew where it was from. Your tag fits perfectly with your theme and is a very thoughtful interpretation of this Swedish tradition. What a beautiful tag. Thank you for sharing some of your culture and tag. Your tag is so beautiful! Thanks for sharing the info about St. Lucia day!!! The tag Is Awesome!!! Love the stamp and would love to have it, I will be a follower of your other blog. I have been a follower on this one for a while now!! Thanks for the chance!!! love the tag very nice! so pretty! I love using kraft paper, I think it can be really elegant! Your tags is very beautiful! You did a wonderful job!